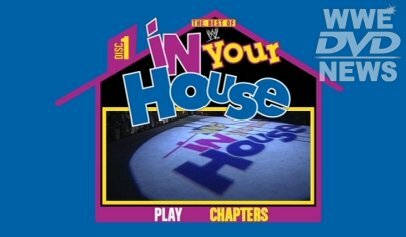 WWE: The Best of In Your House officially hits stores this time next week! Before that, get an exclusive sneak peek at the DVD and Blu-ray in the video clip below. Returning to WWE after over 15 years, Todd Pettengill is your host. Want more? Click here to pre-order the In Your House DVD or Blu-ray! It’s released next Tuesday to the United States. The content is made up of 16 matches on the DVD, along with the newly filmed segments with Todd Pettengill, plus exclusive to the Blu-ray edition are 4 additional matches and 2 extra segments. Fans in the UK get it next month through WWEDVD.co.uk, and the same applies to the Australian market also in May when pre-ordering now at WWEDVD.com.au. Several WWEDVDNews readers sent word of finding copies of the Blu-ray edition out early at FYE stores right now. That’s currently priced at $39.99. The Best of In Your House is also available to order at WWEShop.com, where for a limited time you can take advantage of the new promo code “SAVEMORE“. That gets you 10% off any order $30+, 15% off orders $40+, or 20% off orders $50+. Click the promotional image below to take advantage of that. Me two I just pre order my copy I can wait to see all the maches ! Todd Pettengill is the absolute PERFECT host for this DVD. This by itself makes the DVD worth getting. I’m looking forward to getting this when released on Blu-ray, or course. Todd Pettingill hosting makes absolute sense and glad that he is. Here’s hoping for a Volume 2 if this sells well enough to warant a sequel. I actually hope one day WWE does a Best of LiveWire and Best of Mania sets. Not sure exactly what would go on them, but it would be fun nevertheless. Volume 2 would be great. They could even include some matches that didn’t air on PPV but were exclusive to Coliseum Video. I know Bret vs Jean Pierre was on the Lumberjacks/Terminators Coliseum video release of IYH 2, but not sure if the rest were recorded. I would think WWE would have them in their vault, they apparently have a habit or recording (and keeping) everything based off some of the unique footage we’ve had in some of the documentaries over the past few years. Thanks I’m glad I finally got it . Daniel Bee is Trish stratus fye DVD the most rare to buy ? I’m not sure if this is the cheapest you ever heard . But I paid $38.99 for it today on amazon. One sold on ebay last night for $78 which seems low itself (often $100-200), so yours is very good yeah. Shame they didn’t load him up with coffee prior to taping, he seems a lot calmer than he used to be. Looks really amazing, i miss the 90s so i have to buy The In Your House set, so many great memories! I am so ready for this set to come out on dvd!!! Pettingill makes a perfect host for this set and i can’t wait to see it and get it on dvd!!! Pettengill was awesome, I use to watch Livewire every Saturday morning.